Leslie Thornton, senior vice president and general counsel of WGL Holdings Inc., a public utility company serving Washington, D.C., Maryland, and Virginia, will speak at noon on Thursday, Sept. 27, 2018, in Room 1312 of the Worrell Professional Center as part of the Business Law Program (BLP)’s distinguished Sager Speaker Series. A light lunch, for the event that will be co-sponsored by the Business Law Society, will be served. Professor Omari Simmons, who is the founder and director of the Business Law Program, will interview Thornton. The event is free and open to the public. Thornton is the current senior vice president, general counsel, and corporate secretary of WGL Holdings Inc. and Washington Gas. She also serves on WGL’s Strategy Council, Risk Management Committee, Anti-Fraud Committee, and SOX Management Committee. 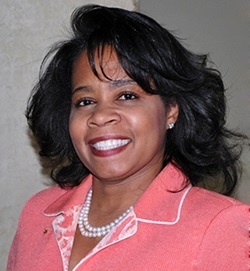 As a member of the NCD Board Leadership Fellow, Thornton’s past experience with WGL includes, but is not limited to, serving on the Board Directors of Career Education Corp. for more than 10 years. She chaired the Compliance Committee and additionally served on the Nominating and Governance Committee. She was also the lead independent director from 2011-2013. Prior to joining WGL, Thornton served in the Clinton Administration where she was the deputy chief of staff and counselor for the U.S. Secretary of Education Richard W. Riley. She was later appointed chief of staff. Thornton was also a partner at Dickstein Shapiro LLP and Patton Boggs LLP. At Dickstein, Thornton conducted and managed sensitive, high-level internal corporate, federal government, and state attorney general investigations. At Patton Boggs, Thornton advised and represented clients before regulatory agencies and helped support their strategic efforts before Congress and the White House. Thornton was selected by the White House in 1995 to serve on the President’s White House Budget Working Group following a government shut down. In 1996, she served in a senior role on Clinton’s presidential debate team. Holding a top-secret clearance, Thornton was also her agency’s representative for the Continuity of Operations of Government program. In 2016, Thornton completed her LL.M. in National Security Law at Georgetown Law. She also received MCCA’s Innovator Award, Savoy Magazine’s top 300 Directors recognition, and Inside Counsel’s Transformative Leadership “Catalyst for Change Award.” Thornton’s legal department won the ACC’s 2016 Community Service Award. In May 2017, Thornton received the 2017 “Legends in the Law Award” from the Burton Awards. Thornton graduated from the University of Pennsylvania with a bachelor of arts in 1980. She earned her Juris Doctor at Georgetown University Law Center in 1983. The distinguished Sager Speaker Series is named for Thomas Sager (JD ’76), former vice president and general counsel for Dupont Co., and current partner at Ballard Spahr LLP. 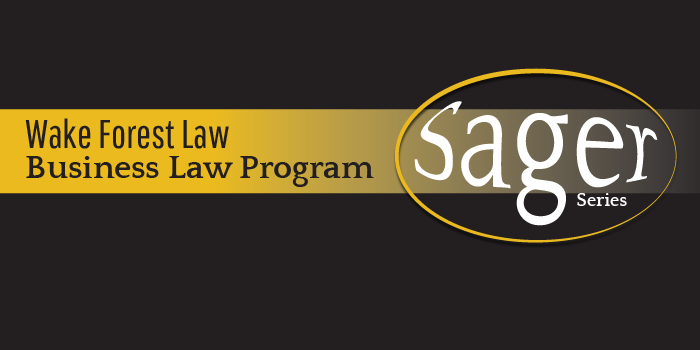 The Sager Series is a part of the Business Law Program, which is a student-centered program designed to expand student opportunities that strengthen knowledge of business law concepts as well as develop skills to assist professional development and readiness for practice. Past Sager Series speakers have included nationally renown arbitrator Kenneth R. Feinberg; Edward Welch, a partner of corporate and securities litigation for Skadden, Arps, Slate, Meagher & Flom LLP; Craig Glidden, general counsel for General Motors Co.; Corena Norris-McCluney (JD ’00), vice president and general counsel of Krispy Kreme Doughnuts; Justice Randy J. Holland of the Delaware Supreme Court; and Sashi Brown, former executive vice president of football operations for the Cleveland Browns.